We’ll cover the materials of a quality running track in this blog. Let’s take a look at what comprises each of these layers. The running track’s sub-base is the layer is the compacted dirt/soil and the crushed rock base. The sub-base is the foundation for everything that is built on top of it so a properly designed and installed base is very important in determining the life span of the all-weather surface regardless if it is asphalt or concrete. It is very important that the base is the proper depth for the soils on site and that it gets compacted to industry standards. This will insure that the asphalt or concrete surface placed on top will hold up for a long time. This will prevent premature cracking as well. When you see a 20 plus year old track with no cracks in the asphalt or concrete surface you know the base was installed to industry standards. 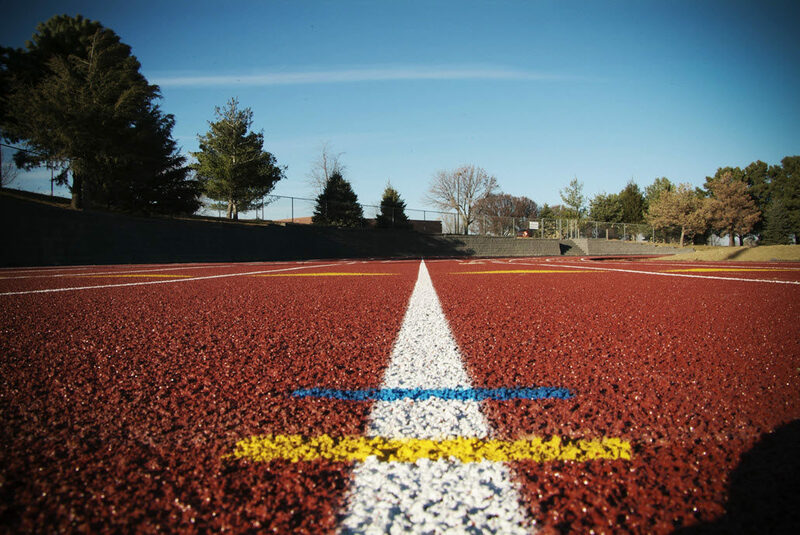 The most common surface used for the running track oval is asphalt. The oval can be built using inner and outer concrete curbs, and slot drains can be incorporated along the inside edge for drainage. The high jump aprons and runways for the pole vault and long and triple jumps events are built using asphalt and or concrete. Concrete tends to hold up better for these events. Black Base Mat: This system is comprised of mixing 1-3mm rubber granules with a poly binder and paving it in place on the track at ½”/13mm depth. This is the entry level track surface. A Base Mat is permeable which allows water to pass through the mat. This is an entry level High School system. Poly Structural Spray: The Base Mat System mentioned above should have a Structural Spray applied on top as the wear course to protect the Base Mat from wear, spike damage and to add UV protection from the sun to keep the Base Mat from getting hard from being exposed to the elements. A Structural Spray consist of mixing pigmented binder with .5-1.5 EPDM rubber granules and then is spray applied to the Bae Mat or as a maintenance coating to an older Base Mat or Base Mat Structural Spray. Many track companies do not propose or install this to the Base Mat during the initial installation to keep the costs down. A Base Mat should at the very latest have a Structural Spray added with in the first five years of its life to keep the base mat from getting hard and cupped out in the lanes from spike damage. A Structural Spray is also permeable. A Structural Spray is used as a maintenance coating to tracks when they need to be refurbished. Base Mat Structural Spray (Impermeable): This system does not allow water to penetrate through the system. It is comprised of the Base Mat which is then sealed with a squeegee applied two component Poly Pore Sealer material that when cured makes the base mat 100% water proof or impermeable so no water can pass through the mat. The system is then covered with two coats of Poly Structural Spray. This system is impermeable and has a finished depth of ½”/13mm. This is a High School and small College system. Sandwich System: This system is an impermeable system comprised of a paved in place Poly Base Mat and then it is sealed with a two component Poly Pore Sealer to completely seal the base mat. The finished top coat is called a Flood and Chip and is comprised of squeegeeing out a two part poly binder. As the binder is being applied 1-3mm EPDM rubber granules are then broadcast into the wet two component poly binder. After the cost is cured the excess rubber is swept up and recycled. This system can also get sealed and varnished for longer wear and UV protection. This is both a high end high school and college level track system. Full Pour: This system is usually installed at the college and division one university level but can be found at some high schools as well. This system can come in several different formulations but generally consists of two or three coats of two component urethane with or without granulated rubber installed and with a variety of optional seal coats that can be applied on top of the finished full pore coating. The layers are squeegee-applied in liquid form. In part 3 of our series on “How to Install a Quality Running Track”, we’ll discuss the role application technique plays in installing a quality running track.